Note: I love historical fiction and when Amy Belding Brown asked me to review her latest book, I jumped at the chance. Her last book, Mr. Emerson’s Wife had been a game-changing book for me. 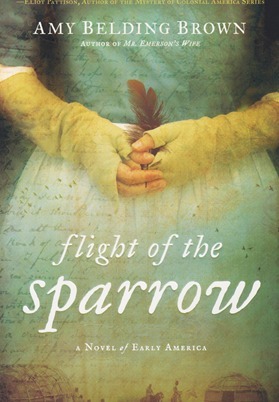 I couldn’t wait to read Flight of the Sparrow given my deep interest in spiritual matters, a lifelong residency in Massachusetts plus my passion for history. I also enjoy reading about moral dilemmas and inner turmoil and how the characters resolve their issues. If you have similar loves, this is the book for you! See the end of this review for a book giveaway! 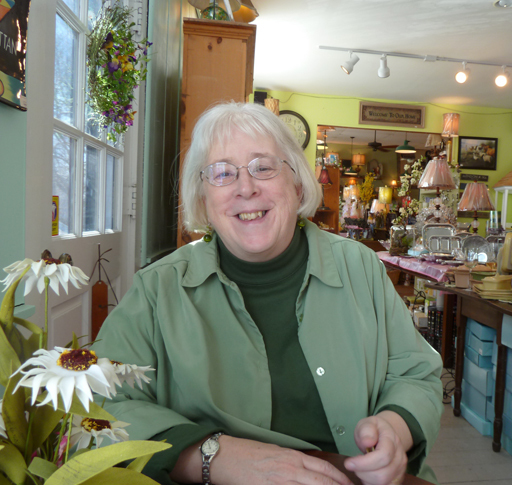 The last time I saw Amy Belding Brown, we were having coffee at a shop in the center of picturesque Grafton, Massachusetts talking about Mr. Emerson’s Wife (see previous post). It turns out Brown had lived in my hometown all this time and I never knew. At that get-together she talked about a new historical novel she was working on which covered the period of King Phillip’s War. Having no knowledge of that war I was to discover that in fact, that period of history was right on my doorstep, not only in the present, but in my past as well. Flight of the Sparrow, set for release on July 1, goes back to the beginning of the Puritan settlement in Massachusetts, using historical fiction to portray the devastating consequences of the epic clash between the English and the Native American. The setting is King Phillip’s war, taking place in the mid 1670’s; its consequences are played out through one Puritan woman and one Nipmuc man. Mary Rowlandson was the wife of a minister in the town of Lancaster. Brown’s main character is based upon a real-life woman whose experiences are documented in a book she co-wrote called The Sovereignty and Goodness of God, Together with the Faithfulness of His Promises Displayed, Being a Narrative of the Captivity and Restoration of Mrs. Mary Rowlandson (available here as text and here as ebook). This religious memoir of her three months as an Indian captive was the first “best-seller” in English America (pg. 329). James Printer, also known as Wowaus, came from Hassanamesit, a Praying Indian settlement founded by John Elliot who translated the Bible for the Indians to aid in their conversion to Christianity. The remains of Hassanemesit are located in my hometown of Grafton, Massachusetts. James Printer helped to set the type for the first edition of Mary Rowlandson’s book. For a time after the war he resided in the sole remaining Praying Indian settlement, Natick, just one town over from my childhood home of Wellesley. After the town of Lancaster is attacked and burned, Mary is taken captive along with her three children by the Nipmuc tribe (her husband Joseph was away at the time). In the course of the battle, her sister Elizabeth is wounded and then killed by fire, Mary herself is wounded, and her youngest daughter Sarah is also wounded mortally; she would die several days later as the captives are led away bound with rope. Mary carries Sarah as far as she can, struggling to ease her daughter’s pain, knowing there is nothing she could do to save her. Adding to her burden is her separation from her other daughter Marie and son Joss. Living in sheer terror from moment to moment during that march, Mary experiences unexpected kindness from James Printer, who frees her from the rope around her neck. It would prove to be the first of several encounters for Mary with this mysterious, handsome and compassionate man. During the first half of Flight of the Sparrow, Brown describes Mary’s captivity, weaving in detailed, colorful and honest descriptions of Native American life. Presenting the beauty and nobility along with the cruelty, Brown brings us into the increasing turmoil of Mary’s mind and heart. Terrified of and angry with her captives one moment, she finds herself admiring their way of life in the next. She gradually accepts Indian ways, from the freestyle way of dress to time spent outdoors, finding solace in the beauty that had before eluded her. She experiences the growing pains of a personal horizon expanding, a heart growing, and the old orderly and rigid ways of her life slowly falling away. In her captivity she discovers a freedom of movement and thought denied to her as a Puritan woman. It is a freedom she will sorely miss when she returns to English society. She is frightened to discover that her rock-solid Christian faith, regimented by spoken prayers and long scripture passages, is failing her. In the end she tries to bargain with James Printer to stay with the tribe when her time to be ransomed arrives. There is of course one other problem: Mary has developed feelings for James and the feelings are mutual. She is able to talk with him freely, expressing herself in ways she never could with her husband Joseph. She finds herself thinking of him and wishing to stay with him despite her status as a married woman. Brown does an excellent job of presenting the moral dilemmas Mary faces both in her captivity and her restoration to the English. I struggled with her status as a slave and the cruelty she endured and yet rejoiced too at the unexpected generosity and kindness of the captors towards that slave. I empathized with Mary’s painful and yet exhilarating transformation as she grew to accept and then love her life with the Indians. I mourned as she was separated from James, the man she truly loved, having to return to the oppressive life she led with Joseph, whom she no longer loved. I felt her grief over Sarah and her concern for her other missing children, her longing to be back with the Indians and her surprising loss of personal freedom as she returned to her old life of repression, rules and propriety. I mourned the loss of her faith and her inability to transcend her Puritan ingraining which favored the letter of the law over than the spirit. While she was able to embrace that all peoples are children of God thus deserving respect and compassion, she could not see that God himself existed beyond the Bible and spoken prayers. The empathy did not stop with the individual characters. Brown expands that empathy to an entire nation of people who, because they lost King Phillip’s war to the English, had their way of life taken from them. Although Brown is equally honest regarding the horrific actions of both sides in the war, the consequences for the Indians prove to be the most heartbreaking. The depth of research that went into the creation of Flight of the Sparrow was evident in the compelling and authentic telling of the story. Brown is not hemmed in by the facts but rather uses those facts as a means of letting her imagination create a multi-layered and emotionally satisfying story. The life journeys of Mary and James not only touch the heart but challenge the mind as well. Just as Mr. Emerson’s Wife exposed and expanded my narrow way of thinking, Flight of the Sparrow caused me to search my heart when it came to meeting and knowing people who are not like me. While Brown’s aim may have been to tell a story about a period she was not familiar with so that she could learn more about her herself and her New England heritage, she has provided that service to this reader as well. 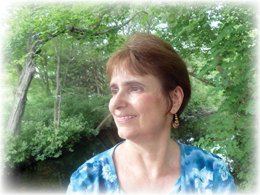 Visit Amy Belding Brown’s website for links to sites carrying Flight of the Sparrow. Win a free copy of Flight of the Sparrow! Be the first to comment on this post and you will win! Flight of the Sparrow is for certain a book I would enjoy reading. It brings to mind, it’s not that much different today than it was then. Yes we have all these electronic devices to make life easier and simpler but do they really? Or do we enslave ourselves in the media? Do we separate ourselves from our family and friends. Let along the world. It’s getting harder and harder for people to communicate with each other. When we hear there was a shooting at a school, we first stop and pray for them and families then move on. Why do we treat it as if it’s a scene from a movie? Where does this come from? What is happening to our human race? While we have these devices and other materialist items, we have to remember who/what is controlling who. It’s good to have these devices, televisions and most diffently homes and cars to live our every day life but not to run our lives. We need to embrace our lives God has given us with love and compassion He has shown us. Because in all reality there isn’t a person who is not struggling with something and the only way that would help and heal us through Christ alone! I am sure I would enjoy reading this book, as I love stories from this era. I read “Mr. Emerson’s Wife” by Amy Belding Brown. We are all just frail human beings, and can easily fall from our beliefs during times of stress and persecution without the help of God. We all want to be loved and cared for by others, so we can easily fail. I read “Mr Emerson’s Wife” and recognized how easily it is to fall, and we have all done so in one way or another. This book sounds very interesting also, as it takes place with a lot of stress, sorrow and persecution from what I just read. We must not judge, as we are all capable of falling in this life from our beliefs, It will be interesting to see how it turns out in the end. Also I found it interesting as my maiden name was Belding and all my relatives were from Amherst, Massachusetts. According to my genealogy I am related to William Brewster on the Mayfloer. I love visiting in New England as I still have a granddaughter that lives in that area. If given the books,I would cherish it, as I love to read. It is my favorite pastime as it allows me to enter other worlds and other eras while staying in my own. if not I am sure I will purchase the book to read this summer. Cool! I am sure you will enjoy it.